didn't i see taht in a wild demo already ... what the point ? Didn't convince me.. and it ran slow on my machine. wasnt there some rule that said it was illegal to reuse previously released material? Noice has done a lot better stuff in the past.. Very disappointed. I liked the visual, even if it was a bit flybyish. The reason I used the word "visual" instead of "visuals "is that there only was one visual. Except for the end part, but it doesn't count. Almost a thumbs down, what happened to all the cool effects Noice did in the past? Unsmooth meshes (gnilk is lazy). Oh, and ofcourse they ripped DXM. Flybyish demo with boring music, but it looks nice anyway. Still one of the worse demos in the compo. Blaah, the animation was nice, so why did you ruin it by turning it into a horrible demo? 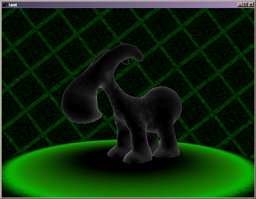 what is this opengl shading language that i have not ? I want to see it and it asks me about a shading language. Where can a find that?!?! We've seen plenty of demos with greyscale/red colour schemes, and now we get greyscale/green. Ugg... Works even less than the former. Texturing was uber plain. Lifeless camera movements. thom: hey, don't be dissin' grayscale+green now. yeah, it's vit in realtime. i guess that's worth something.. music is cool but perhaps a little *too* thumpy for this particular demo. I'd like to watch this, but it crashes during startup. please fix your init code. the musiC´s kewl,but would fit a demo with faster transitions better.! added on the 2007-10-14 09:02:46 by ɧ4ɾɗվ. page created in 0.082497 seconds with 15 queries.